At one time I probably could have been convinced to bet serious money those two pictures are of the same ******* suit. Last edited by kmortis; 14th July 2015 at 08:59 AM. It could be the single best piece of evidence. 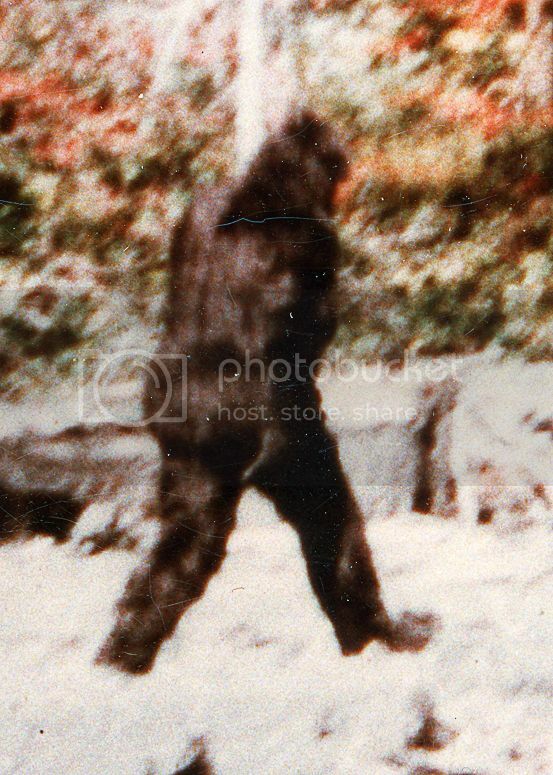 If your best piece of evidence is a guy in a suit, it's screw city for bigfootery. It's either that or the various patterns that can be seen across thousands of reports. Yes, yes. What sort of evil genius could read a BFRO report and type something similar. It's almost impossible. That's a projection of your own personal suspicions about Patterson's character on the sentence I wrote. You wouldn't see it that way if you had the opposite opinion about Patterson. "If you already believed as I do, you would see why you ought to believe as I do..."
The copy of frame 352 that I posted was obtained by MK Davis from Patricia Patterson's copy of the film. He paid to get high quality scans of several different frames of the film at a photo lab. Frame 352 was one of them. Frame 61 is from Bill Munn's inventory of Cibachrome scans. There's a few more from that copy that I can post if you want. I think CT Logic dictates that when you search something for the second time you have re-searched the subject. ...come back here and we'll let you know the reason for the failure. He feels that a discovery can happen within the next 3 years, but isn't willing to bet on it. Ironically, OS doesn't seem to have much more confidence in it being him or his "team" who make said discovery...despite having supposedly encountered Bigfoot on a couple of occasions. You're mistaking me for someone else. I've never had any encounters and I'm not on any kind of research team. I'm pretty sure you've rambled on before about going out into the woods with people, and that's all I essentially meant, as there are no valid "research" teams out there who're thick enough to go looking for a figment of Roger Patterson's imagination. Didn't you have a thermal sighting, or is that Northern Lights? I remember the first time I smoked some Northern Lights, didn't see a single Squatch. How many female Bigfeet have been spotted by anyone who sees them? barely mentions any Bigfeet with the mid torso breasts. Have you done any research here at International Skeptics or when it was JREF? say to keep the illusion going. PS Did you answer my question about your experience with guns? The Golden Age of the Bigfoot Fetish is over. It's downhill from here and everyone knows it. When everyone in the woods has a cellphone with camera the excuses for no pictures or video devolve from special pleading to kicking and screaming. Sure, you can walk around the woods with a thermal camera and pretend to be hunting as they do on Finding Bigfoot but eventually even the stupidest Footies will notice that they never find anything. It used to be that cell phone cameras were crap. That was the reigning excuse. Practically every cell phone sold today does high res pictures and 720p video. Bigfilter has conspired with bigcamera to digitally exclude bigfoot from all exposure. Look for the tell-tale shrubbery or suggestive logs that cover him. Brilliant! Google is surely involved. I believe his claim of having photos and videos because of the details of his encounters and the investigation that occurred, not because he claims to have photos and videos. Isn't this the same logical fallacy you criticized earlier? You are making a decision regarding the veracity of a video/film based on outside factors rather than on the video evidence itself. At least those who don't believe the PGF have at least seen it. Ever noticed Patty doesn't have a buttcrack? Though it does have a backseam. "Hey Patty, I like the way the little line goes up the back of the monkeysuit. I've always liked those kind of wader hips too. No, no, no, don't take it off; leave it on, leave it on. Everybody wants some . . . I want some too!!" It got filled in with woodape putty. These two images are of the same frame from the PGF. There is a vertical stick or twig in front of the left calf. Note how the length and thickness of that stick is different in the two images. I did not scale the two images so that they would be the same size, but I believe that a point can be made here anyway. I think I understand the phenomenon on film known as "bloom" whereby light-colored and/or overexposed objects become larger and/or change shape. You can see that happening with the stick. But I think that that can't really be the end of the story. It would seem that darker objects (such as Patty herself) would become smaller and/or change shape because of the "invasion" of the blooming of lighter objects in the background or foreground. This suggests to me that there may be challenges to determining true size and/or shape of almost anything in the PGF stills. I cannot say if this phenomenon is entirely eliminated when examining the higher-quality still frames. Additionally, the bloom phenomenon is not going to be limited to the outline/silhouette of Patty. There are lighter and darker areas all over her body, head and face which would be subject to bloom and therefore changing size and/or shape. This would seem to matter in any analysis in which there is discussion of size and shape of any feature. I would accept that excuse even now. I can barely take acceptable pictures of my own cat using my cell phone, which is a pity because she is a beautiful Siamese with white boots and mittens. Certainly. This is the whole problem. Bad pictures happen. Some people don't have the knack of taking pictures. However, if 2 million tourists strolled through your place every year, some of them with thousands of dollars of camera kit, others with the proclaimed intention of taking pictures of your cat, then you can bet your sweet bippy that some amazing pictures of your cat would be out there. 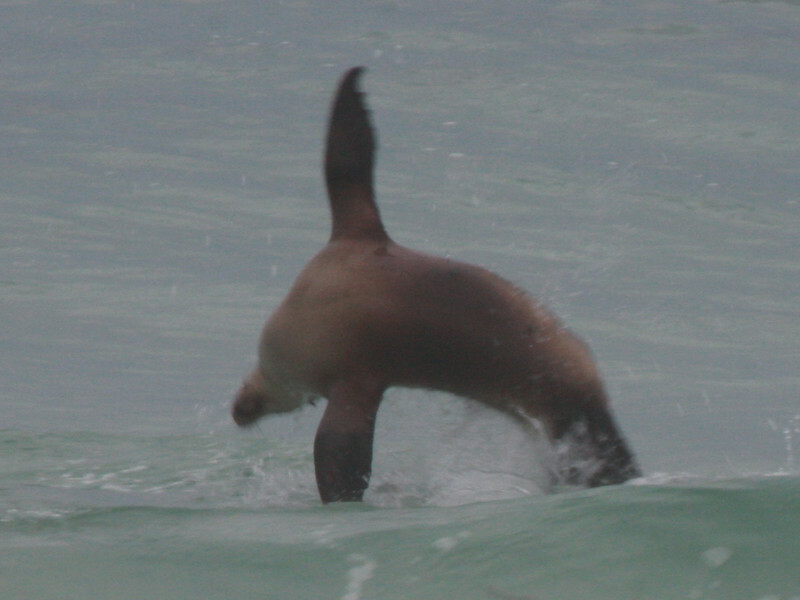 If I can go on a whale watch and take this, why aren't there any pictures of Bigfoot this good? Easy - you're not lying about seeing the orca. 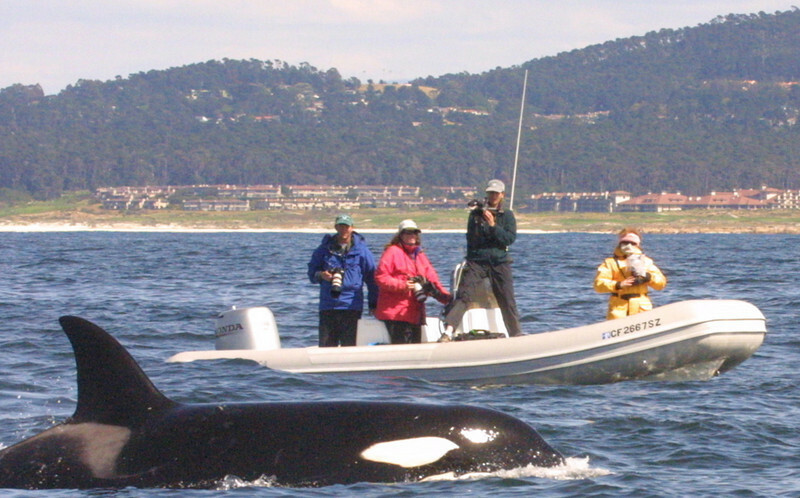 Or, more generously, I actually did see the orca. Of course not - orcas are real. The woods on the hills are out of focus. There are probably hundreds of bigfoot smiling right at us! Prove me wrong. Last edited by Wolrab; 26th July 2015 at 08:32 AM. Ummm...you're in denial, you're ugly, and your mama dresses you funny? ETA: oh, wait, I mean "some patching". Last edited by Slowvehicle; 26th July 2015 at 09:12 AM. I guess it must mean that orca are more common, and less intelligent than Bigfoot, and find it more difficult to hide. Darn. You've run rings around me, logically. They are everywhere! If there's a blur, it's a Bigfoot. If there's cover, Bigfoot is behind it. That is why they have spread from coast to coast without being seen on roads, bridges, or crossing rivers. Of course Orca doesn't run an hide from humans, humans haven't been killing them for hundreds of years... oh, wait. 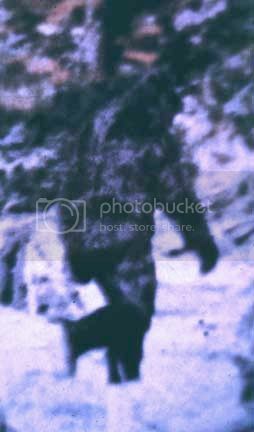 Rene Dahinden's Blue Creek Mountain Bigfoot Trackway Footage. What PGF looks like stabilised.